Ghirlandaio. Michelangelo's lifestyle was he was a painter and a sculptor. He created paintings and sculptures. He created the sculpture "David" and he painted the sistine chapel. His greatest patrons were Pope Julius II and cardinal Raffaele Riario. "Michelangelo Biography." Bio.com. A&E Networks Television, n.d. Web. 12 Nov. 2013. "Michelangelo Buonarroti." About.com Art History. N.p., n.d. Web. 13 Nov. 2013. "Michelangelo Buonarroti." Biography. N.p., n.d. Web. 12 Nov. 2013. 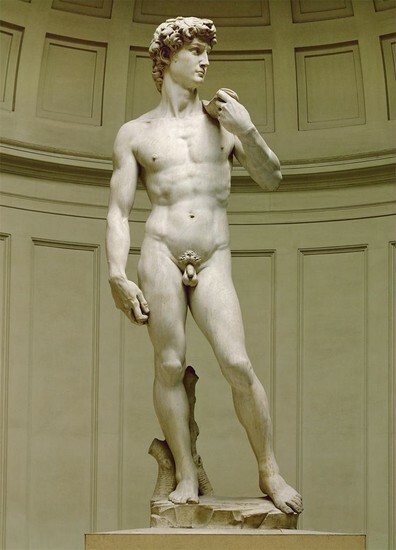 "Michelangelo's David." David. N.p., n.d. Web. 14 Nov. 2013. "Michelangelo Powerpoint." Michelangelo Powerpoint. N.p., n.d. Web. 14 Nov. 2013. "Michelangelo Sculptures." HowStuffWorks. N.p., n.d. Web. 14 Nov. 2013. "Michelangelo." Smore. N.p., n.d. Web. 13 Nov. 2013. The piece David is located right out front of the main Government building of Florence. The thing that was significant about this statue is that it was a structure of enormous civic and spiritual significance to the city of Florence. This piece is interesting because it is a massive stature showing how great the human body is. I also find this interesting because it is so detailed and well created. Humanism, because it shows glorification of the human body, as David looks Strong educated and elegant like the ideal human being should.